Many builders bandy the label “expedition yacht” around these days, and for a builder to invoke the name Magellan, the first circumnavigator in 1519, takes a certain chutzpah or perhaps even hubris. Azimut, a brand perhaps best known for sleek yachts designed to move crumpets and champers to and fro along the Riviera, has carried it off in fine style, and has created a yacht you might want to use to cross the 100-fathom curve outbound. 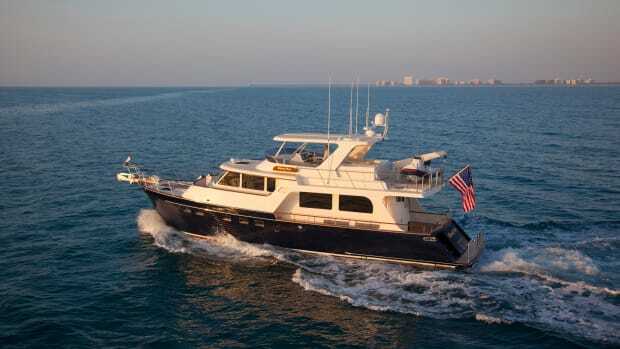 Part of the four-yacht series, the Magellano power cruisers range from 43 to 76 feet, several well-publicized offshore cruises proved that the line-up is more than able. This, however, is cruising with a difference. This is cruising in grand style, not man-against-the-elements. Not when you have helm chairs upholstered in alligator, Lucite racks for your Dom P, and drawer pulls of finely stitched Italian leather. Even if you’re crossing an ocean, the crumpets will feel right at home. And you can, in fact, cross at least part of an ocean. 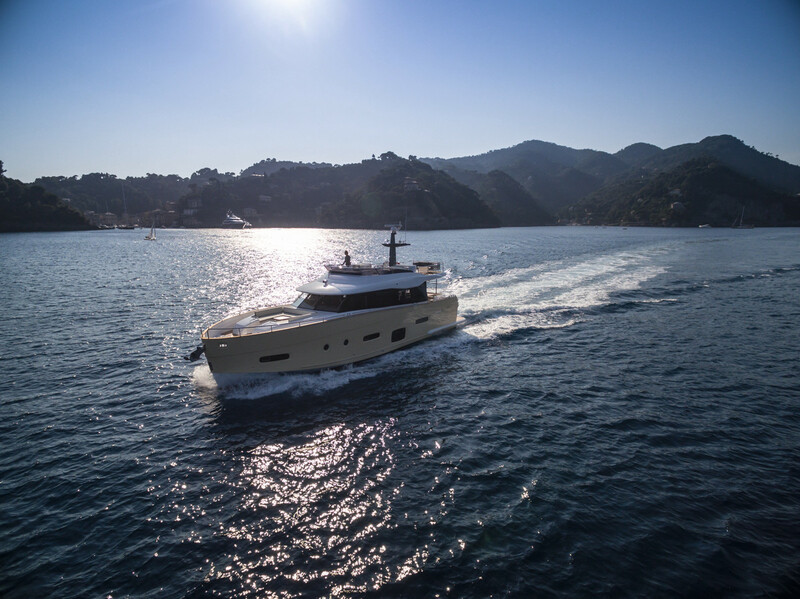 The design team (more in a moment) created what they call a “dual-mode” hull, enabling owners to travel long distances at trawler speeds or race back at 22 knots to make a dinner reservation at La Palme d’Or in Cannes. At 5.5 knots, the 66 has a range of 3,000 nautical miles, which may not be quite transatlantic but easily gives you San Francisco to Honolulu. A number of designers had their fingers in this particular Magellano. 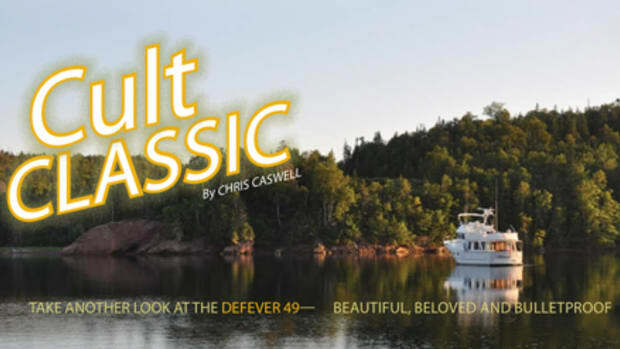 English naval architect Bill Dixon had done the underwater lines for the original Magellano 43 but, for the 66, Cor D. Rover, a Dutch designer best known for megayachts, styled the exterior, while Italian superyacht designer Pierluigi Ausonio of Plana Design did the naval architecture. In horse racing terms, this particular pony would be Rover out of Dixon by Ausonio, with the Azimut design team as midwives. 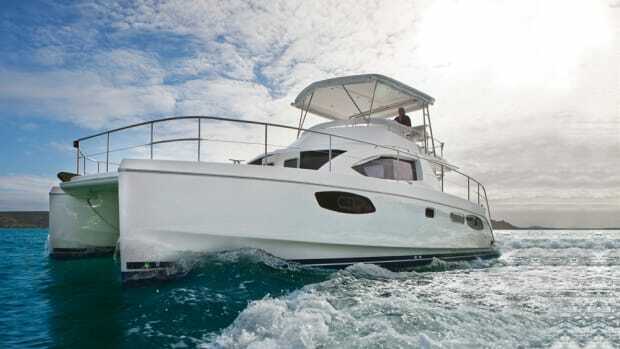 The hull, in spite of the dual-mode label, is basically a semi-displacement hull that responds to horsepower with speed. The more the power, the faster she goes. 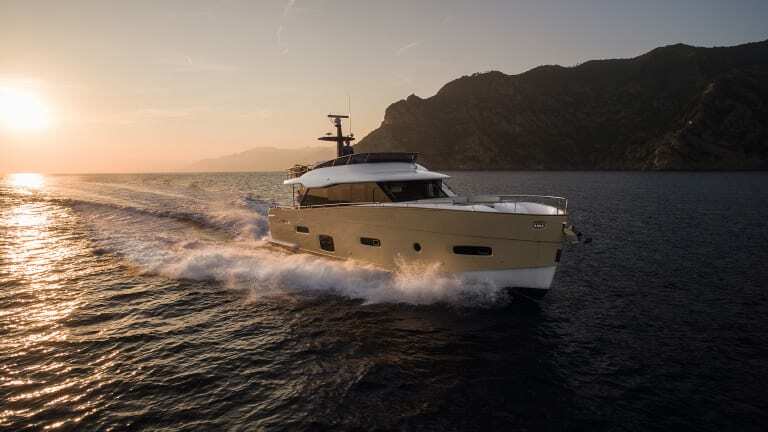 The plumb bow makes her styling au courant, as well as creating a waterline as long as possible for efficiency, and Azimut couldn’t resist a little reverse sheer as a reminder of their sportier lines of yachts. That dual-mode hull can only be described as tall, and you shouldn’t expect to hop aboard at deck level unless you’re on a very high pier. There are boarding doors into the cockpit, but at a height that suggests dock steps will be appreciated. Our test 66 had the optional hydraulic swim platform, and its added length makes it easy to board from floating docks as well as from tenders. 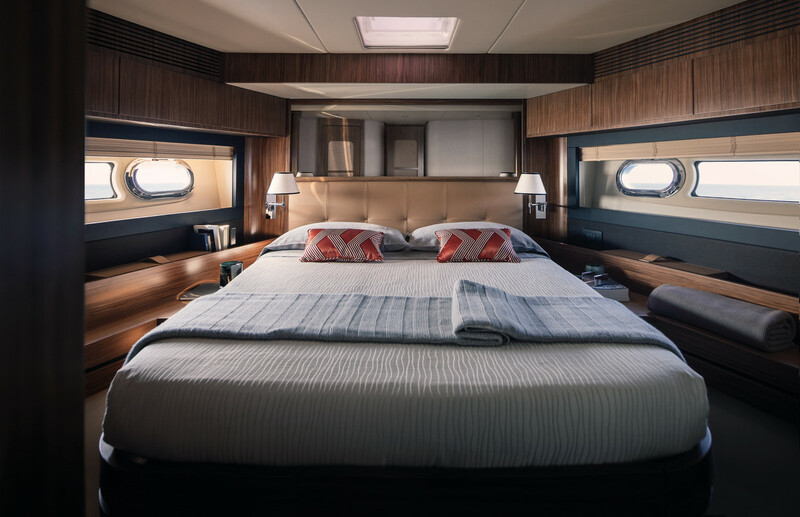 The tall topsides give immense inside space, which Azimut has used well to create a full-beam master suite amidships, a most civilized VIP stateroom forward, a twin cabin to starboard, and a single-berth cabin to port, plus crew quarters for two abaft the engine room. 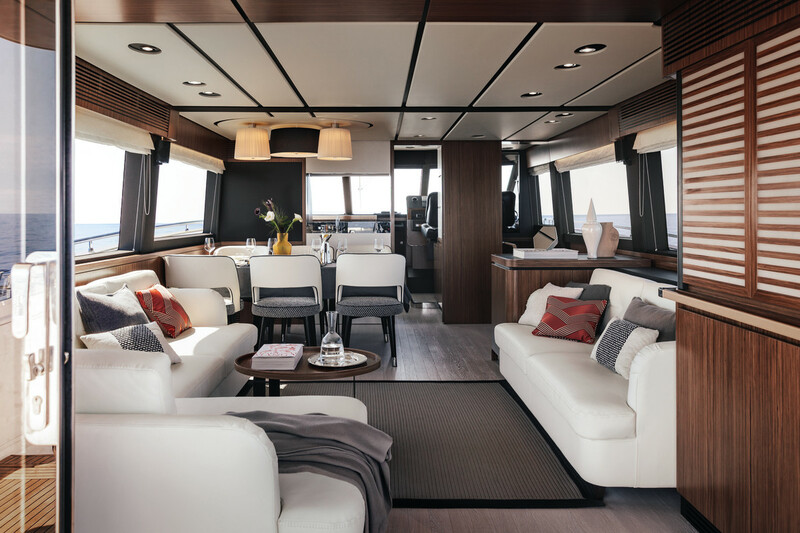 The saloon exudes Azimut style, with luxe couches, a formal dining area for six, and the ubiquitous pop-up TV. Bowing to offshore needs, Azimut offers a Navetta version as an alternate layout, which puts a solid bulkhead at the forward end of the saloon, thus blocking off the galley and lower helm. Good for night running, at the expense of sightlines aft from the helm. The galley is chic, with a Miele four-burner induction cooktop and Vitrifrigo fridge with two drawers, but somewhat lacking in stowage for your boxes of Wheaties. A pantograph door provides deck access as well as allowing the crew to come and go without tramping through the saloon. I’m wary of yachts that have absolutely no sea rails on galley counters (or elsewhere) to protect the fine woodwork below from spilled porridge, and this seems a surprising omission for an offshore yacht. 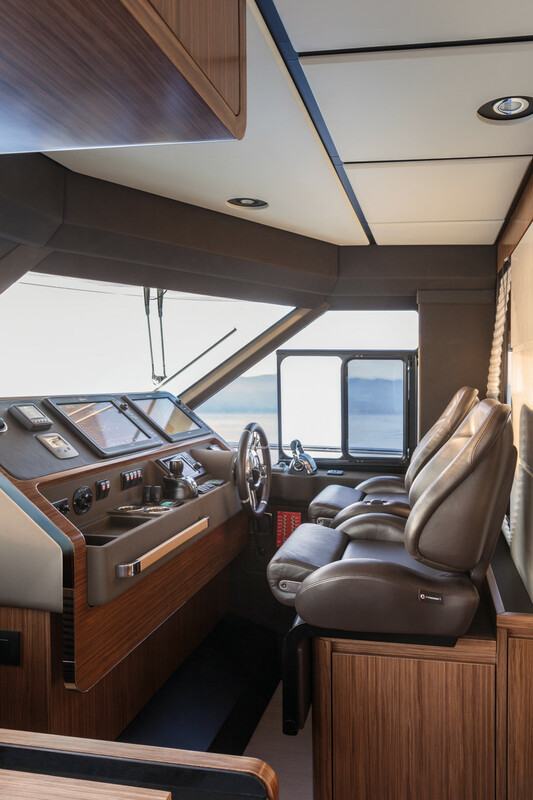 I found the helm opposite the galley imposingly high, with twin bolstered seats atop a cabinet, but that height is needed to see over the equally high dashboard with twin Raymarine monitors and, once settled on these thrones, they were quite comfy. The window next to the skipper has a sliding panel and this particular 66 had what I thought was a clever touch: Instead of placing the joystick control in the middle of the dash (pretty useless for maneuvering), it was moved to the window ledge next to the shifter/throttles. Thus a skipper can stand on the side deck with the window open and control docking with excellent visibility. It’s a great solution for short-handed cruisers. What will certainly make most skippers drool on long-distance cruises is the flybridge, which seems to stretch out to the horizon. 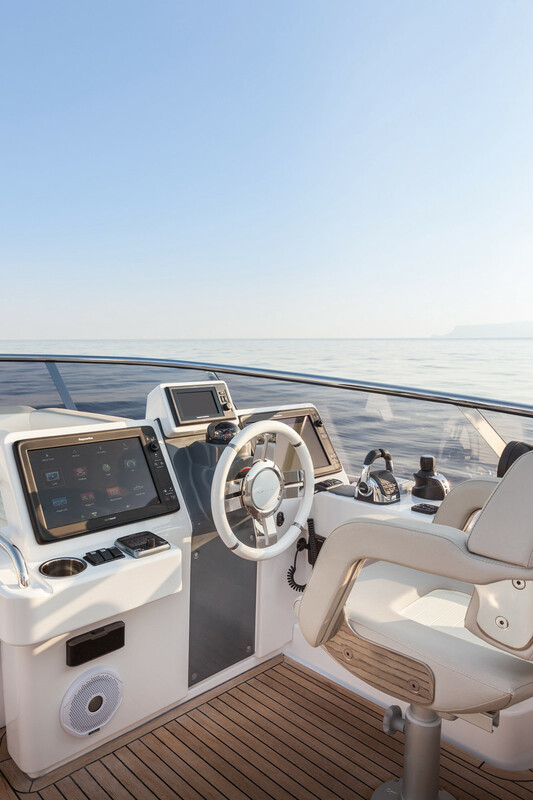 It starts well forward of amidships and goes all the way to the transom, providing shade for the cockpit below, and it’s how Azimut utilized this space that is most impressive. 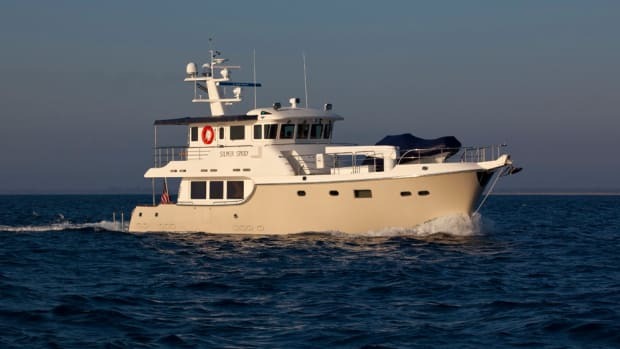 Like every good tramp freighter, the Magellano 66 has a sturdy mast at mid-bridge, carrying an array of electronics on several levels, as well as (on our test yacht) a fiberglass hardtop to shade the forward bridge. 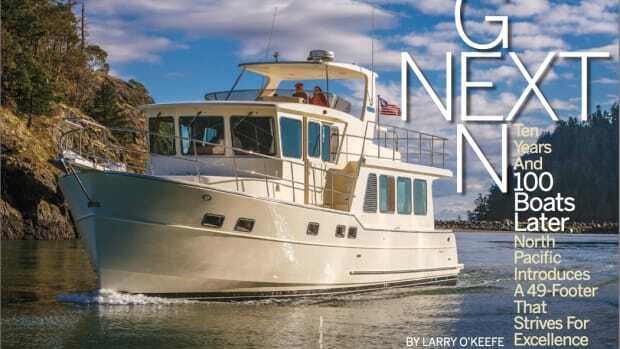 Under that shade is the upper helm, plus pure decadence with an aft-facing couch and a large settee with a teak dining table facing a fiberglass console with Kenyon grill. Alas, no sea rail on that counter to keep a plate of steaks from skating into the deep blue. 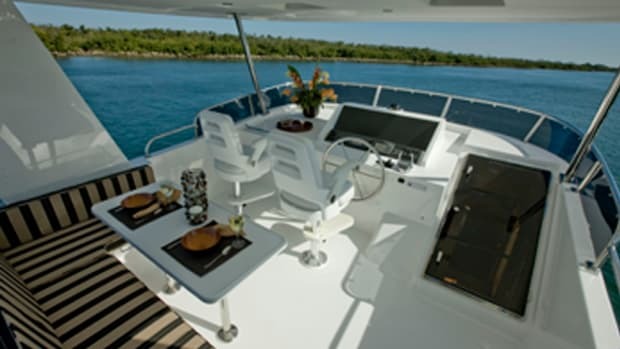 The Magellano 66 sports copious seating areas for outdoor dining and lounging. Azimut has thoughtfully left open the entire after portion of the teak-planked bridge, so owners can create their own landscape. One could put a dinette there but, my gosh, there are already alfresco dinettes everywhere: forward on the bridge, on the afterdeck, and even a big one on the foredeck for use at anchor. 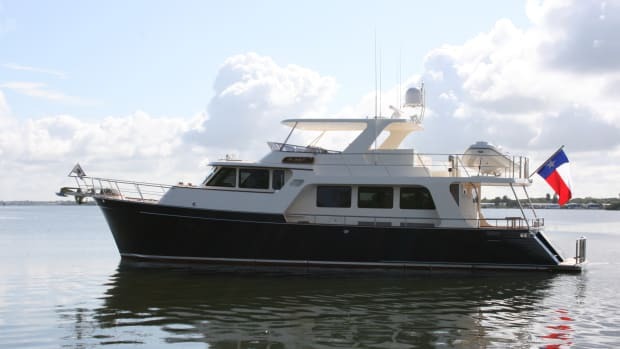 Some owners may opt to fill this area with stylish chaise lounges, and a shower on the back of the mast will serve to cool those broiling on the chaises. For cruisers, however, this is a boat deck where you can store a large tender, water toys, kayaks, SUPs, or all the other stuff that comes with cruising. 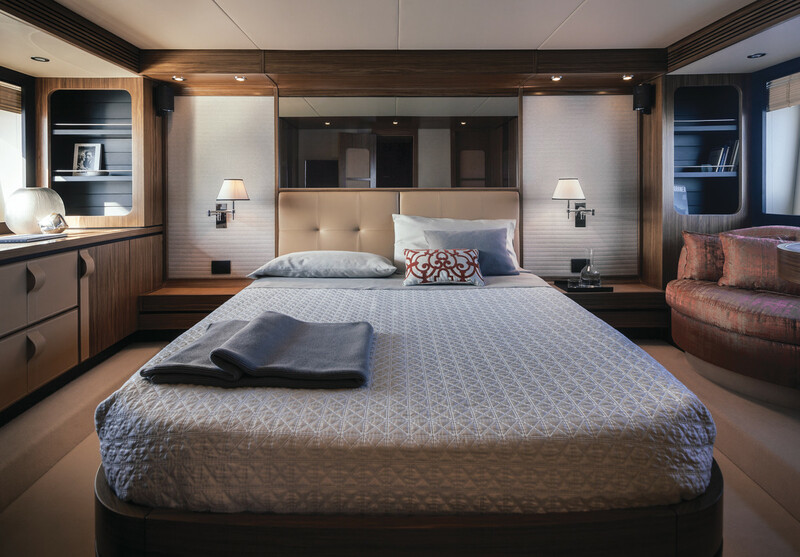 The master suite is classic Azimut, with a tufted Italian leather headboard on the centerline berth, leather-faced drawers, and a cute chair with (on our test boat) an alligator-topped desk/vanity. The two hanging lockers have several shelves but only one short bar for hanging clothes, so plan to fold your finery. The corridor forward to the VIP stateroom passes the twin cabin to starboard with direct access to the day head while, across the hall, what seems at first glance to be a lower berth is actually a large stowage area. The VIP has the same niceties as the master suite, but far more storage for reasons that I can’t fathom. The hanging locker is twice the size of the one in the master, and there are two full shelves slanted for shoes. Up on deck, this is clearly a seaman’s yacht, with wide teak-planked side decks well-protected by high bulwarks capped by stainless steel rails that make moving around at sea safe and secure. Forward, a pair of gullwing-door lockers provide ample stowage for fenders, docklines and other deck gear. A single anchor roller is provided, with good access to the rode locker to sort out any problems, and beautifully welded hawse holes lead to stylish but sturdy cleats. Aft, I particularly liked the two stainless-topped consoles in each corner of the cockpit with roller fairleads aft, a foot-controlled warping winch, and oversize cleats. 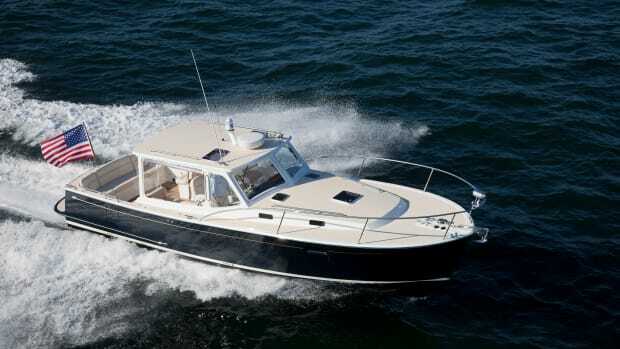 Standard power for the Magellano 66 is a pair of 800-horsepower Volvo D13s that can push her to over 22 knots through V-drives. The standard Kohler 9kW genset is on the small side unless you have a very long shore cord, so owners are likely to upgrade to the 20kW genset in the “Advance” package offered by the manufacturer. 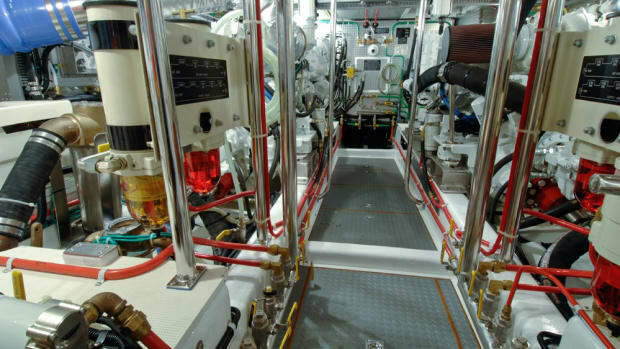 The engine room is reached through a heavy hatch in the cockpit teak sole (that could benefit from a more energetic gas lift) and, once inside, you have stooping headroom on smooth fiberglass panels between the engines. Fuel filters were hidden behind the exhausts, while the general plumbing and wiring was a bit random. In all fairness, however, this 66 was in the process of being commissioned for a new owner, so additional systems had been added and the commissioning process may well have tidied up some of the loose wires I spotted. When it comes to engine mounts, I’ve always preferred polished stainless steel, while these were rather industrial-looking and still bore the welder’s markings. In spite of some shortcomings, I liked the Magellano, not for her dual mode hull but for her dual personality. On one hand, she’s all the best of Euro-luxury from the fine fabrics and leathers to the quality joinerwork. On the other, she’s fairly tugging at her docklines to head to faraway places. 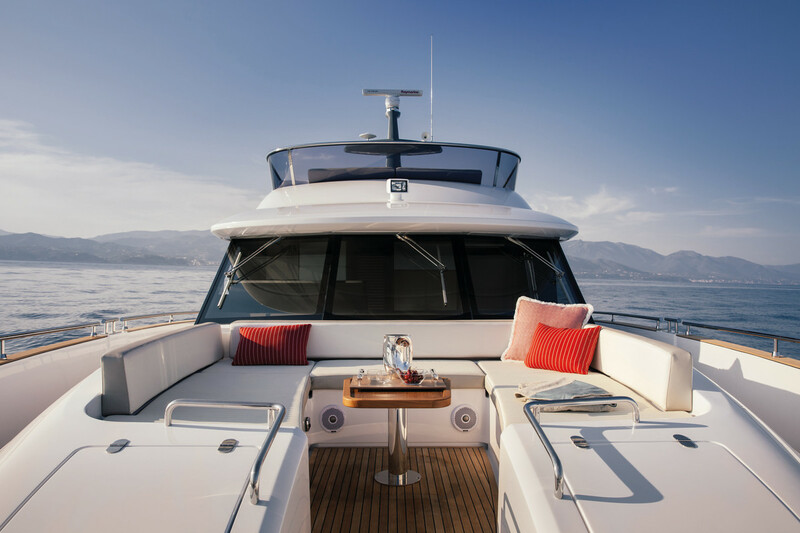 Whichever of her personalities proves dominant, the owners of an Azimut Magellano 66 will know that they can travel in grand style as far as they choose.